So as is already well documented, I’m a huge fan of the juicy, crispy deliciousness that is fried chicken. One problem, my waste line isn’t as big of a fan, or maybe it’s too big of a fan if you get my drift. I’ve recently (and by recently I mean this week) embarked on a weight loss journey so for a little while fried foods just ain’t gonna happen in this household. Ok, no big deal… Ok, kind of a big deal since I love anything fried. This means that I need to figure out alternatives to the fried dishes I had previously devoured, namely fried chicken. Yesterday I wracked my brain trying to think of a way to take chicken breast, and bake it, and still have it be juicy, crispy and delicious. No small task there… but I did it! 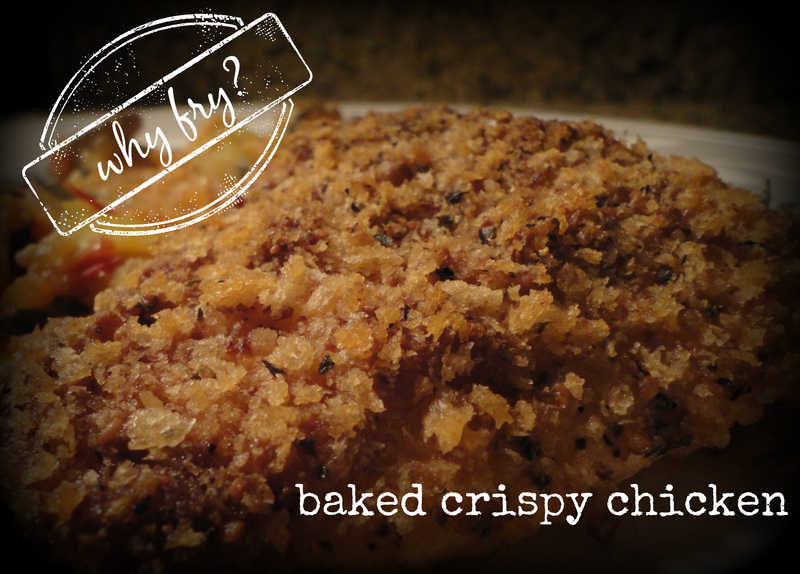 So here’s my recipe for a BAKED crispy chicken that may have you put down the fry oil forever. Wash off the chicken breast then pat them dry with paper towels. Lightly season them with salt and pepper. In a bowl mix together the mayonnaise, grated parmesan and garlic powder, then liberally coat the top of each chicken breast with the mixture. Do not coat the entire piece of chicken. We’re not breading the whole breast because if we did the coating underneath would just be a soggy mess. We’re only coating the top, thus we only need the mayo mixture on the top. Capiche? Combine all of the ingredients for the coating in a bowl, and then pour them out onto a plate. Place the chicken top side down (mayo side) onto the panko mixture and lightly press down to get an even and ample coating. Then place the chicken coating side up on a lightly greased baking sheet or dish. Bake until the panko coating is a light golden brown, approximately 40-45 minutes. Viola… crispy, juicy, delicious chicken that you didn’t need to fry! Serve it with your favorite side and chow down. Tags: baked, crispy chicken, panko, parmesan, perfect pairings, perfect pairings at home, why fry. Bookmark the permalink. Now you’re talking. I love fried food, too. What a great alternative.